The luxury camping site at California Camping Village on the Italian Maremma in Lazio is indeed a haven for beach enthusiasts. With bungalows, cottages and apartments located in verdant settings just off Rome, this holiday camping site is replete with modern amenities, fun, sports and entertainment options, plus impeccable mobile home services to make your stay comfortable and enjoyable. Get in touch with Lux-Camp for a wonderful “glamping” experience! Why Should I Camp at California Camping Village? A spectacular combination of sun, sand, water, lush greenery and comfort sets this luxury camping site apart. Pleasant surroundings, pristine settings and guest-friendly services make luxury camping at this holiday camping site most appealing. Separate play areas, games, entertainment and a swimming pool for children ensure that your kids have a safe and fun holiday. The ancient pine forest adjacent to the campsite and few sites of archaeological interest nearby add to your luxury camping experience. 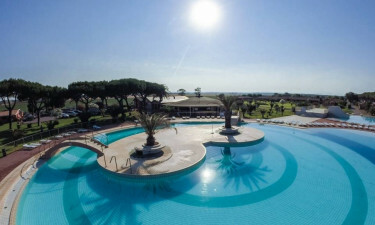 The large swimming pool styled like a tropical lagoon is the activity hub of this resort, where you can catch up with games and other events organised by Lux-Camp, apart from, of course, cooling off or lazing in the sun. The private beach with parasols and loungers offers uninterrupted views of the sea and sand, while the excellent sports facilities cater to active guests. 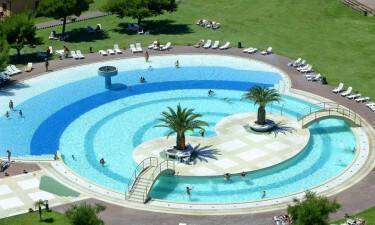 The resort’s spa with Turkish bath and other features add to the camping luxury. The restaurant and bar at this camping holiday site cater to your dining and wining choices, offering the best of Italian cuisine – be it fish, meat or pizza.